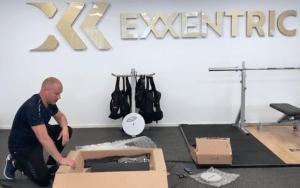 How to quickly get up and running with the kBox4. Place the kBox4 on its feet on a flat, stable surface. Please note that flywheels are packed separately from the rest of the kBox system. Release the flywheel locknut by pulling the black knob (see video). Remove the flywheel locknut and mount the flywheel or flywheels. 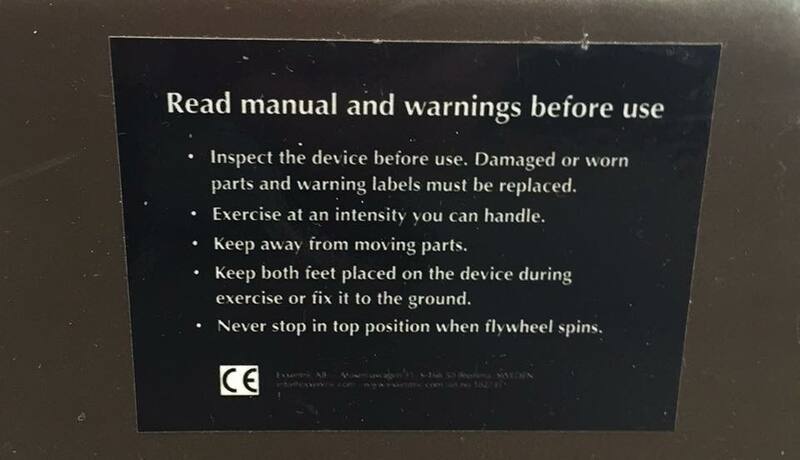 For your first exercise it’s recommended to start with one large flywheel. Fasten the flywheel locknut by pushing it back onto the shaft until you hear a ‘click’. 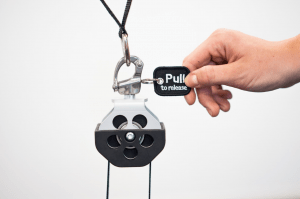 Open the snap shackle by pulling the “pull to release”-tag connected to the pulley block. 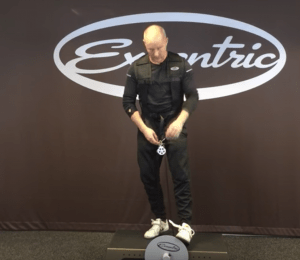 If using the Exxentric Harness, turn the flaps with the rings inwards with the red stitching facing each other so the flaps don’t cut into the inguinal soft tissue (see video). Plug in the kMeter module to the socket underneath the kBox and turn on the kMeter module (if your kBox was purchased before May 2018). The kBox4 Active is compatible with the kMeter II but it needs to be purchased separately (all other kBox4 systems include a built-in kMeter II since May 2018). 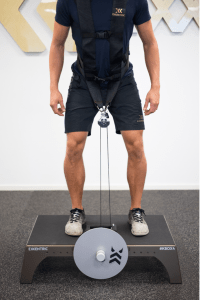 Adjust the belt length as desired by holding the belt release button down while you position the pulley block in the desired top position and wait until the excess belt has been rewinded automatically. If you are using a harness you can also disconnect the harness from the pulley block using the shackle.